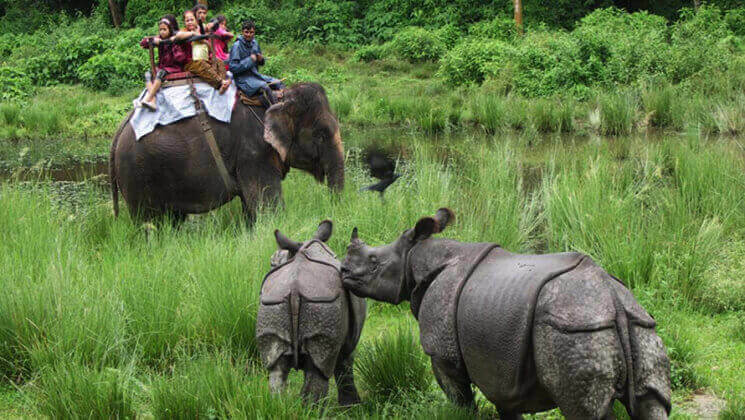 Chitwan jungle safari tour is very popular tourist activities in Nepal. The meaning of Chitwan is heart of the jungle. Chitwan national park cover 932 square kilometer (360 sq miles) and declare as the world heritage site by UNESCO in 1979. A huge number of travelers come to visit Chitwan national park for jungle safari activities every year. Chitwan National Park located in the central Terai lowlands and offers some of the best wildlife – nature sightseeing places in Asia. The Park stakes its eastern border with the Parsa wildlife reserve of Nepal. Sauraha Chitwan is a gateway to visit National Park. chitwan nepal is a wonderful place of lush sub-tropical jungles and the home of several animals such as Elephants, Tiger, wild boar, bear, 1 horned rhinoceros including many species of birds and reptiles. So, it is one of the most demanding wildlife safari or jungle safari tour in Nepal. Elephant back riding safari in Chitwan National Park provides an opportunity to get a closer view of the endangered one-horned rhinoceros. chitwan national park entry fee is different for foreigner rather than SAARC countries. So, book chitwan jungle lodge and ask for jungle safari jeep tour while you are exploring. There are regular chitwan safari bus from kathmandu to sauraha. Furthermore, you will have to familiarize with the vibrant Tharu lifestyles, their culture, and tradition. Remember us for Chitwan jungle safari tour package in the lowest price comparing others. Winter time in Nepal but generally clear skies. But still, a beautiful time to discover wildlife safari. Monsoon season in Nepal. So, it is not a good idea to do jungle safari tours because of the tall grasses, so a chance to see animals are very less. Monsoon is over around early of September, but some drops of rains still possible in September but still very nice time to discover wild life activities. 01 Night 02 Days : Chitwan Jungle Safari Tour package! Day 1 Arrival in Chitwan, Transfer to Hotel. Reception with welcome drinks. Lunch, and Elephant back riding safari. At evening little walk to sunset than dinner before you visit Tharu cultural show. Day 2 Wake up Call, visit bird watching tour, breakfast. Than departure. 02 Nights 03 Days: Jungle Safari Tour package! Day 1 Arrival in Sauraha Chitwan and transfer to Hotel. Reception with welcome drinks. Lunch, and Tharu Village excursion, Museum and sun set tour, Dinner. Day 2 6 am wake up call for breakfast, Canoeing, Jungle walk, Visit Elephant breeding center. After Lunch, we go Elephant back ride safari or Jungle drive (optional). Evening at dinner than visit Tharu Cultural show program. Day 3 Wake up at 6 am, walk for bird watching tour. Breakfast and trip departure. 03 Nights / 04 Days: Jungle Safari Tour in Chitwan Sauraha package! Day 1 Arrival in Sauraha Chitwan than transfer to Hotel. Reception with welcome drinks. Lunch and walk to visit local Tharu Village and their Museum. Get sunset and follow the dinner. Day 2 Breakfast than walk for canoe riding and on return with jungle walk. Lunch and 4WD jeep for Jungle Drive. After delicious dinner visit to see Tharu Cultural Show program. Day 3 Breakfast than visit Elephant Breeding Center. Lunch and elephant back riding safari. Dinner. Day 4 6 am to wake up, walk for bird watching tour. After breakfast trip finish and departure. 04 Nights 05 Days : wildlife safari or Chitwan jungle safari tours! Day 1 Arrival in Sauraha Chitwan than transfer to Hotel. Reception with welcome drinks. Lunch and Tharu Village excursion together with Tharu Museum. Evening little walk to get sun set tour than return to hotel for dinner. Day 2Breakfast than Canoeing, on return Jungle walk. Lunch and than Jungle Drive. At evening we have delicious dinner than visit to Tharu Cultural Show program. Day 3After breakfast visit with our expert Nature guide to twenty thousands lake. Bird watching on the way. Return to lunch at hotel than little jungle walk. At evening, enjoy with your delicious dinner. Day 4 Wake up at 6 am, have a breakfast than visit Elephant Breeding Center. Lunch and elephant back safari. At evening, you will have delicious dinner. Day 5 Wake up, visit for bird watching. Return to hotel for breakfast than departure.